Impression: Oh, this is so lovely. I could read this book a thousand times. 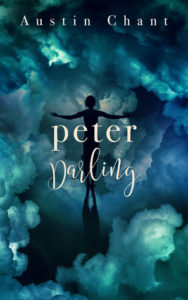 I was never the biggest Peter Pan fan, but Peter Darling took so much of what I love about stories and storytelling and the weight of imagination and wove it all together with clever and enjoyable prose. It’s a story about self-identity, about love, and about escapism, and about eventually figuring out what you need to face the real world. Austin Chant’s Peter is all kinds of impulsively charming, growing more thoughtful as he’s forced to reckon with the feelings and uncertainties he’s trying to outrun. And Hook, oh goodness: he starts off as the shallow archetype, the dastardly villain, the pirate—and is slowly revealed, unwoven, undone and remade into a genuinely compelling and interesting character and a love interest you’re actively rooting for (I was very surprised but overwhelmingly delighted). The worldbuilding is extremely clever: re-inventing that which needs it within the familiar, nostalgic outlines. The pacing is also a gem, particularly in the way that information is revealed: slowly, starting off with things ‘as expected’ and incrementally starting to pull threads and turn expectations on their heads as the story starts to snowball, then change and transform. PS: The ending? Very, very satisfying.